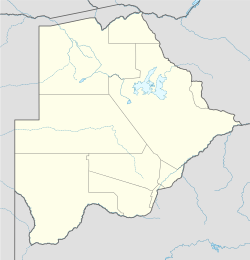 Shoshong is located just north of the Tropic of Capricorn at latitude -22.95, longitude +26.48, in the Central District of Botswana, about 40 km west of Mahalapye. The town is situated 3,000 ft (910 m) above sea level in the valley of the Shoshong, an intermittent tributary of the Limpopo. Nearby villages are Tobela, Ikongwe, Kalamare, Mmutlane, and Mosolotshane. Shoshong is encircled by hills used for grazing cattle, and is a windy place. The central kgotla is located by the mouth of the steep valley (kloof) which used to be the source of water for the village. Shoshong was initially inhabited by Baphaleng (Tlou and Campbell 1997; A.M. Chebanne and K.C. Monaka 2008), who were later joined by Bakaa, and later BaNgwato under King Sekgoma I. Oral traditions from the village points that Baphaleng chief invited Bangwato from Mosu where they were continuously harassed and vulnerable to Matebele attacks. The site of Shoshong was chosen as being easily defensible against the Matabele. Being the meeting place of trade routes from south and north it was of considerable importance to early explorers (including David Livingstone) and traders in South-Central Africa. In 1875, King Sekgoma was overthrown here by his Christian son Khama (later Khama III/the Great). In 1885 (at the time of the declaration of the British protectorate of Bechuanaland) Shoshong had 20,000 to 30,000 inhabitants, including about twenty Europeans. By the 1880s, Shoshong had existed in the same location for forty years, possibly a record for a Tswana town. But it become a 'Desert City', almost waterless with 'one trickling well' and with 'indescribable filth'. Due to the water shortage, in 1888-89, Khama and most of his followers removed about 1890 to Phalatswe/Old Palapye, 95km (60 miles) N.E. of Shoshong, and later to Serowe to the north-west of Palapye. Like Shoshong, these places were built in valleys of tributaries of the Limpopo. To make up for the loss of the defensible location, Khama had made an alliance with the British who were preparing a forward movement to take over Mashonaland and Matabeleland. However, by 1898, Phalatswe was also running short of water, and Khama ordered some of his people back to Shoshong. The Baphaleng returned in 1900, and the Bakaa in 1902, while the capital relocated to Serowe. At the publication of the 1911 Encyclopædia Britannica, Shoshong had a population of about 800. In the 2001 census, the population of "Shoshong and Associated Localities" was listed as 11,176 people, including 7,490 in "Village Shoshong". In 2012, Kgosi Sediegeng Kgamanes decision to install his son as chief created controversy. Kgamane is described as "a prominent Mongwato royal and uncle to president Ian Khama." Historically Shoshong’s chieftainship had been held by three tribes from three different wards of the Bakaa, BaPhaleng and Bagwato simultaneously sitting at the Kgotla to deliberate the issues of the people. ^ a b c d e f g h i Chisholm, Hugh, ed. (1911). "Shoshong" . Encyclopædia Britannica. 24 (11th ed.). Cambridge University Press. p. 1014. ^ Mackenzie, John (1887). Austral Africa: Losing It or Ruling It; Being Incidents and Experiences in Bechuanaland, Cape Colony, and England. London: Sampson Low, Marston, Searle & Rivington,- via World Digital Library. Retrieved 2014-06-19. ^ Dipholo, Kabelo (2012-04-27). "TRIBAL WAR BREWING IN SHOSHONG". The Voice. Archived from the original on 2013-01-31. Retrieved 2014-06-19. This page was last edited on 27 December 2018, at 21:51 (UTC).